Take the guesswork out of keeping your baby safe and invest in a quality hardware mounted baby gate. These are especially important to install at the top of any stairs in your home. There are many different types of baby gates on the market, but this category is one that will make the biggest impact. This is because it is designed to be semi-permanent and ultra-safe. Wondering what’s the best hardware mounted baby gate for the top of stairs? Take a look at this list to find out. This lightweight aluminum hardware mount gate is an easy choice for top pick because it latches automatically, has a sleek look, and is easy-to-use. It is a customer favorite for baby safety and has an optional stop guard for use at top of stairs. "They are installed with screws into your wall or door frame, or banister! This means that they cannot fall over or be moved easily. This means that they are generally safer, as well as meant to be left in one spot". So, if you need to truly secure a dangerous area in your home, equip yourself with one of the leading models of hardware mounted baby gates on the market. Children are notorious for thwarting the efforts of their parents to keep them safe, so make that as difficult as possible for them! All you need to get started is a tape measure, an electric screw gun (for ease of installation), and this handy guide to help you choose which gate is right for you. After careful research of the best hardware mounted baby gates on the market, including countless consumer reviews, specifications about safety, and various features, I have narrowed down the selections to the best available with the best value. These are all important considerations for the average family, so that you have options that truly make sense for your circumstances. I will include pros and cons for each so that you can this guide to easily choose what is right for you. Adjustable width: 26.5" to 40.5"
This gate is a customer favorite because of ease of use and great features. It’s biggest draw is that it automatically closes and locks after you open and walk thru. It is made with powder-coat finish aluminum, so it is lightweight and rustproof, both excellent features. Plus it comes in either black or white. The patented latch system is well-thought-out and is perfect for high-traffic areas, as well as at the top of stairs. Because it allows for a quick pass-thru in either direction, it gives your opening a smooth transition, which is always a good thing when it comes to baby gates! 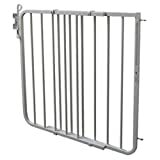 The gate width is adjustable from 26" – 40", and the height 29.5", with a bar spacing of 2.5 inches. Plus, extensions are available if you need them. Adjustable width: 26.5" to 40.5". The autolock child safety gate is 29.5" tall. This gate was reported to be fairly simple to install and is mostly well-liked by consumers. I like that it comes with an optional “stop-guard” for use at the top of stairs, as this is an important safety feature. Overall, I feel that the value and operation of this gate makes it one of the top on the market right now, despite some of the trouble issues. Discount Link - Buy Cardinal Gates Auto-Lock Gate on Amazon, Now! Considering expense, features, and safety, this gate is a great buy. The material is matte bronze-colored steel. It can swing open all the way from its one-hinged side and is designed to be operated with just one hand. Because it must be securely attached to your walls, it is just right for the top of stairs. It will fit an opening that is 28" to 48" wide and it is 31" tall. The empty space between the bars is just 2-⅞", which makes it perfect for not allowing baby to slip through. Gate fits doorways 28.68” wide – 47.85” wide and is 36” in height. Now for the biggest drawback with this gate: installation. It is known to be kind of a pain to get it positioned right where you need it, even if you are following the instructions. Check for differences in width between the lower & upper sections, especially if you have baseboards. Don’t rely only the included instructions. First, set everything out and do your measuring carefully. If you can deal with the annoying install, you will have a fantastic gate that is well worth the headache. Despite the drawbacks that are noted, this gate is definitely one of the best gates at this price point. Since it’s a simple gate without the need to spend too much, it is a great option for many families. Ask someone to help you install it and plan for a little extra time even with that help, but once it is in place, you will be set. Buy North States Supergate Easy Swing & Lock Gate on Amazon, Now! Known as the “slam” gate, this hardware mount is designed to be shoved or pushed or even “kicked” (not too hard!) closed. It is doesn’t not have a trip bar at the bottom and has a stop guard, making this an ideal gate for the top of stairs. Height: 30", Fits: 29" to 42". Will this fit your opening? It expands from 29" to 42" wide to fit a variety of openings and is 30" tall, but can be installed 3" above the floor for 33" of protection. The neutral color is great for most homes and the gate is metal with a plastic latch system. Though some customers have reported a few issues of quality and operation, overall this gate has quite a few stellar reviews. It is mid-priced, so is fairly affordable, but doesn’t have as many features as some gates. Probably the part that I dislike the most is the plastic handle hardware which could feasibly fail with repeated usage, but for some families, this would most likely not be deterrent. It seems sturdy overall and is worth your time to consider. Discount Link - Buy Evenflo Easy Walk Thru Top Of Stairs Gate on Amazon, Now! This unique aluminum baby gate is a contemporary and aesthetic option if price is not a concern. It has an Indexed Sizing System and Integrated Tuning System to get installation perfect even when your walls are not perfect. Though installation would not be described as “easy,” this gate is designed to look fantastic and be ultra-sturdy when in place. Height: 30-½", Fits: 26-½" to 40". One of the favorite features is that it can actually be removed from its position when not needed without unscrewing it. Just lift it away from its wall mounts. This is handy if you have times when you don’t want the baby gate in place, because it gives you the option to remove without all the work. The gate accommodates openings that are 26-½" to 40" wide. This gate has fantastic reviews and is a very sturdy, beautiful gate that does its job well and gets noticed. However, it does come with a hefty price tag, so those extra features come at a steep cost. If you have the means to get stylish with your baby gate, I think you will likely love this gate, but if you are looking for something more simple and affordable, then this one may not justify the cost. Discount Link - Buy Munchkin Loft Aluminum Gate on Amazon, Now! I love that this extra-long gate can be installed straight across or angled at pivot points. Plus it is super strong and has an extra-wide door opening (25.5”!). Another great feature is that it can be removed from its wall mounts if you need to take it down temporarily, or can be swung out of the way during times of non-use. It has 15” extensions (sold separately) so that you can make it even longer, if necessary. The arched gate and “linen” finish go great with any home decor. And it has a “stay-open” feature for those who find that handy. Fits Spaces between 38.3" to 72" Wide and 30"high. This is a well-loved gate that is a great value for its length. Plus it looks fantastic and is strong. It has multiple great features and is very versatile. I highly recommend this gate if you have a lot of area to cover. It may be easy to get overwhelmed with the installation, so plan ahead to garner some help. some better screws, and some uninterrupted time. 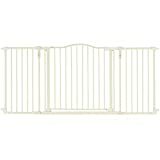 Discount Link - Buy Supergate Deluxe Décor Gate on Amazon, Now! A beautiful bronze metal gate with an arched doorway, this unit is not only extra-wide, but extra tall...standing 36” high at the top of the door and 33” at the railing. It has an easy, one-handed latch system making it easy to walk through. The opening is 19” wide and there is a rail along the floor. The gate does swing both ways, but it does not latch open. Plus the gate can be removed from the wall mount brackets, if necessary, for easy removal. The best feature about this gate is that it is fully adjustable, so it can fit a variety of different sized openings. This is a solid choice for an extra-long, extra-wide gate, even though it doesn’t come with any special “extra” features. It just looks pretty and does its job well. Reviews are quite good and there are many happy customers. Some have reported difficulty in installation, but that is not uncommon for a hardware mounted baby gate of this size. It is a bit on the pricey side, but if it is the size and look you need, it definitely should be taken into consideration and should hold up nicely for you. Discount Link - Buy Summer Infant Metal Expansion Gate on Amazon, Now! So there you have it, multiple options to help you find the best hardware mounted baby gate for your needs and the safety of your little one. Whether you are looking for more or better features, a super-sturdy gate, something that looks fantastic to go along with your decor, or a really great value, I hope you have found just exactly what you are looking for. I hope this guide has been helpful to you as you explore all the possibilities!